Numbered from the edition of 250 on the underside. 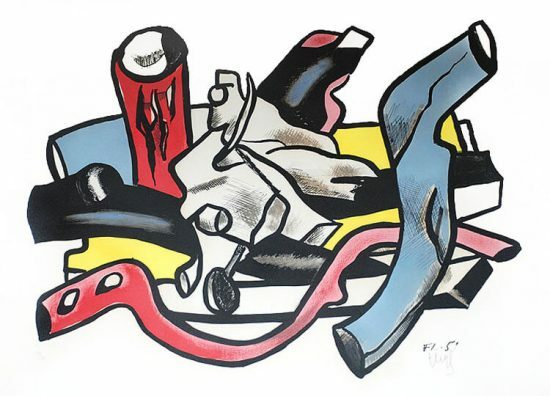 This work is initialed ‘F.L.’ by Fernand Léger (Argentan, 1881- Gif-sur-Yvette, 1955) in black in the lower right. 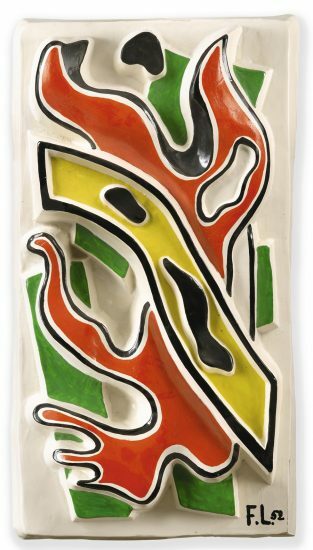 Fernand Leger Les Acrobates (The Acrobats) is a work of pure artistry in the ceramic medium. 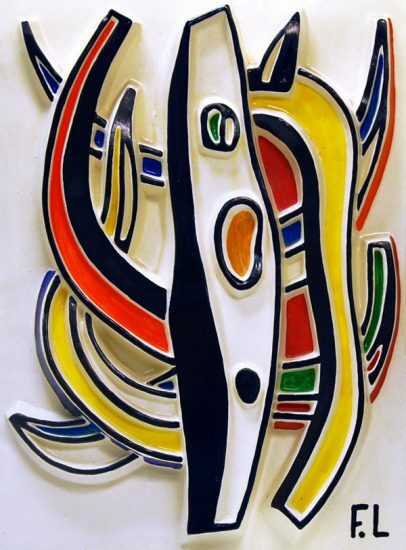 Leger’s sculptural ceramic works are considered the highest point of his Cubist practice. 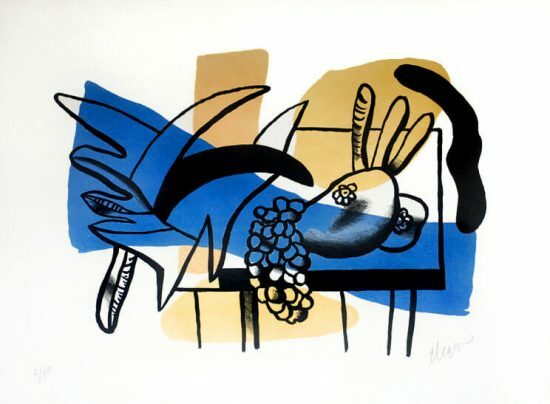 From the distorted proportions to the flattened perspective, each quality typical of Cubism is enhanced as a sculptural work. 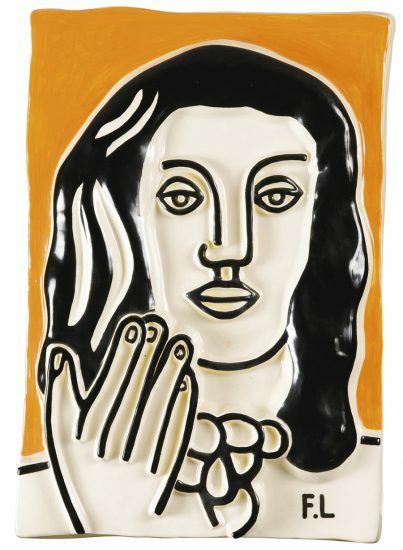 Leger began creating enameled terracotta low reliefs based on the patterns of paintings he had created prior to 1950. 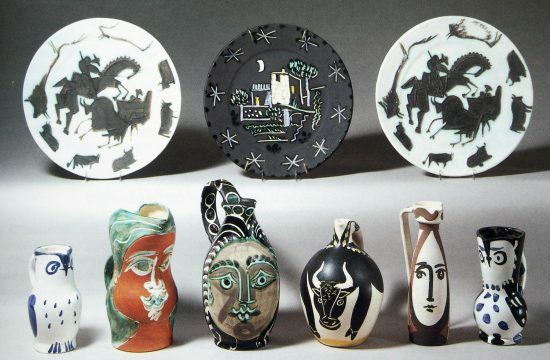 Most of his ceramic works even share the same motifs as his paintings. 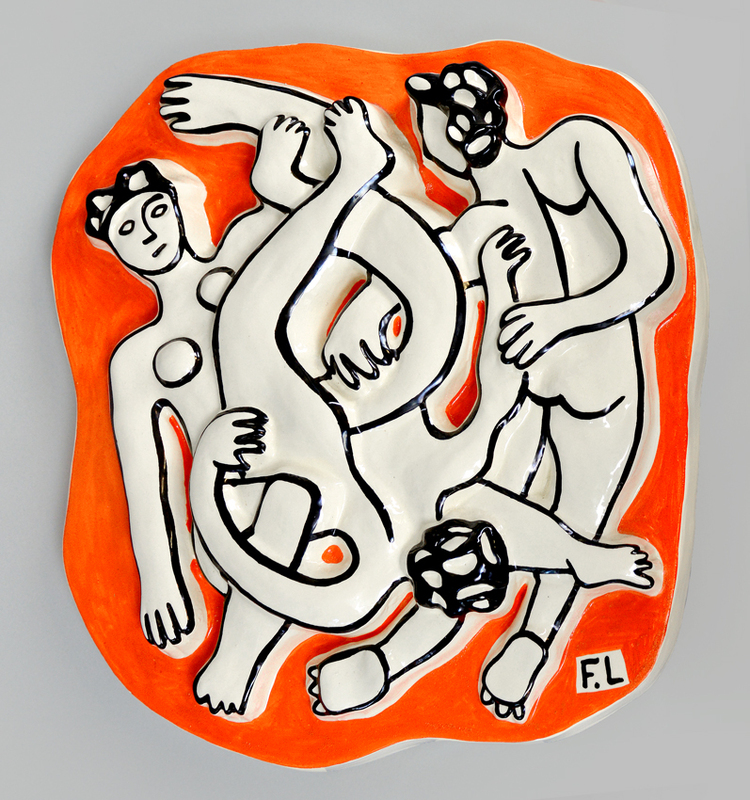 In this ceramic work, three figures intertwine playfully indifferent formations. Their limbs are long and winding, creating a cartoonish depiction of three acrobats performing a trick. 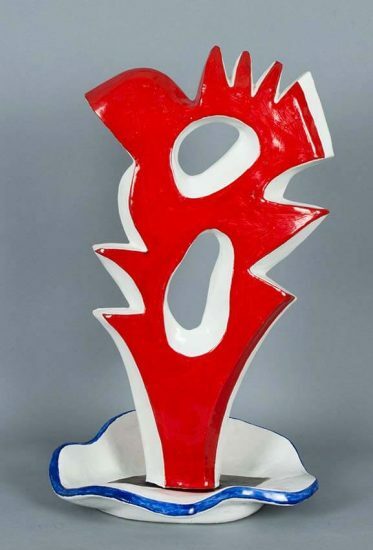 The background is a vibrant red which contrasts beautifully with the white colored figures. The figures are outlined in black, creating a multidimensional effect. It appears as if the characters are floating towards us. 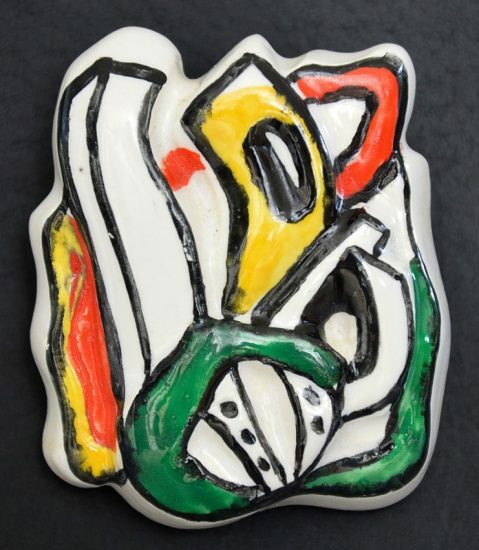 Created in 1954, this terracota low relief ceramic plaque; clay with black, red and white enamel is initialed ‘F.L.’ by Fernand Léger (Argentan, 1881- Gif-sur-Yvette, 1955) in black in the lower right. 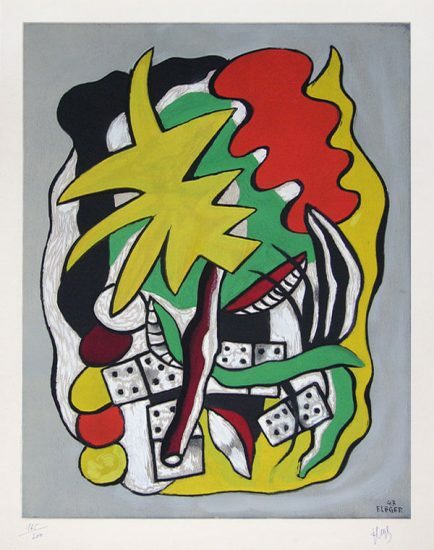 Numbered from the edition of 250 on the reverse. .
Fernand Leger The Acrobats (Les Acrobates) is fully documented and referenced in the below catalogue raisonnés and texts (copies will be enclosed as added documentation with the invoices that will accompany the sale of the work). 1. Brunhammer, Y. (2005). 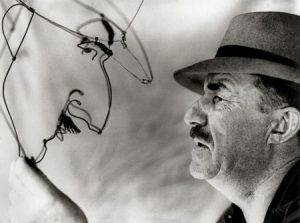 Fernand Léger: The Monumental Art. 5 Continents Editions: Milan. Listed and illustrated as catalogue raisonné no. 145. Further discussion on pgs. 132 & 140. 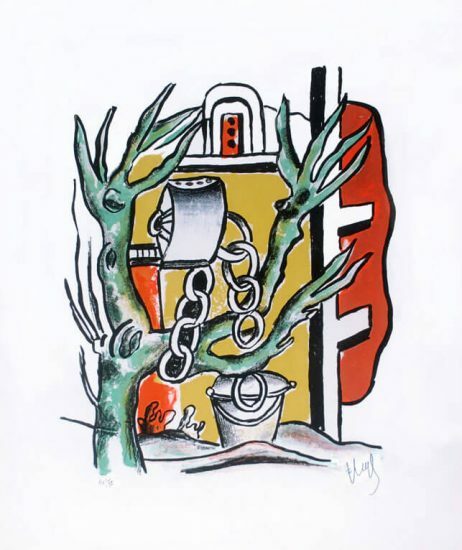 Sell your Fernand Léger fine art with us. We offer free evaluations.